The majority of the beginning was character building and relationship establishing. While at first I wrote this off as boring, I came to appreciate it when the real drama of the story occurred. 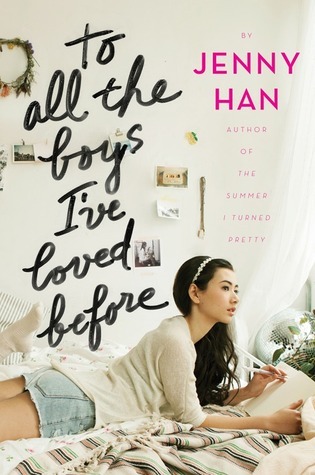 As Lara Jean is confronted by boys she thought she'd left behind, she has to decide what to make of the feelings that arise when she sees them again. Lara Jean is a character you can't help but see yourself in, even if you can't relate to her situation at all, and all you want to do is root for her. I love seeing her growth from the beginning to the end of this first book. The character dynamic is just fantastic. Lara Jean is super close to her two sisters. Margot, the eldest, is sort of like a mother figure to her because their mother has passed. Kitty (real name Katherine), the youngest of the three, is at the ripe age of eight years old; old enough to understand things, but not old enough to really understand everything. I just love each of these personalities, and their relationships are portrayed as realistic sibling relationships. And not to sound insensitive or offensive in any way, but I liked how what became of their mother was not dramatized. No life long battle of cancer. No huge car crash. No mysterious murder. It speaks to me because it tells me that little things happen sometimes, and it doesn't have to cause a huge commotion for it to be significant. Legitimately what I assume I must've looked like while I was reading this book. I don't want to spoil anybody so I'll avoid talking too much about the romance. All I can say is that, I was not expecting A LOT of what was going on, which made it that much more realistic. The writing in this book is pretty good; funny some times, moving at the right times, and amazing all the time! Overall this was a super cute book with great themes, characters, and writing. I definitely recommend it! The ending is a bit of a cliffhanger though, so have that second book near before you start this!